A contributor in Staten Island, New York has several film cans unseen since World War II which he believes may contain German home movies of Nazi officials, possibly even Hitler. He received them from his wife’s uncle, a GI in Germany, who found the cans in the bombed ruins of the Old Opera House in the northern Bavarian town of Bayreuth. 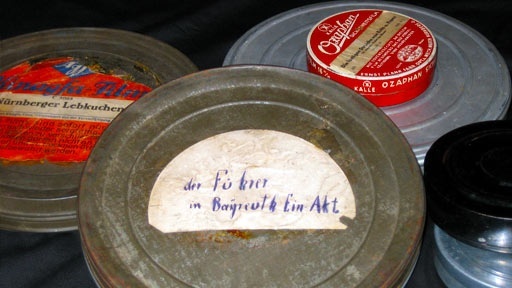 The first glimpse at one of these fragile reels reveals intriguing footage of Hitler, Goebbels, Goering and Himmler apparently arriving at the Richard Wagner opera festival staged annually in Bayreuth. History Detectives examines this film’s depiction of how the Nazis manipulated art and culture to bolster the party’s following. Also in Depression and WWII: 1929-1945 Nazi Spy Toys Did a Nazi spy buy these toy soldiers? Also with Gwen Wright Leisurama Homes What happened to the Leisurama homes apparently widely sold in Florida?